SAGE Accpac ERP Accounts Payable Integration for the GWA-OW Calculator software by A.D. Morrison & Associates Ltd.
Are you struggling with Social Services Bank Reconciliations every month? Streamline the bank reconciliation process and the issuing of payments using our A.D. Morrison & Associates Ltd. integration. This unique custom developed application imports all Social Services entitlements into Accpac Accounts Payable as invoices, then cheque/EFT payments are issued from Accpac. In a few easy steps, you can reduce your month end reconciliation time down to under one hour! Cut down on paper and time. Distribute your financial statements electronically to managers! It's easy! Create custom lists of departmental statements for each manager, generate one single Excel file with individual worksheet for each department, and email the workbook. It is always a cumbersome process generating your financial statments when the managers' departments are not in a range. Eliminate this manual process, save time and the environment! Peace Hills Trust - Are you still manually clearing cheques when completing month end bank reconcilations? Simplify this tedious process and reconcile your cleared cheques in seconds! 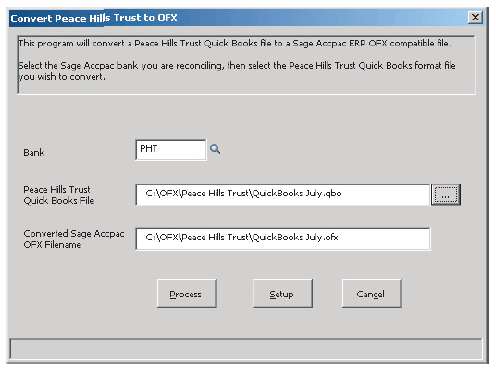 This new conversion utility takes your current Peace Hills Trust statement download file and quickly converts it into standard file, ready for import into Accpac. Reduce bank reconcilation processing time by hours, or even days! Manual paper distribution and mailing of invoices and pay advices is now a thing of the past! No more folding, stuffing and stamping! eTransmit provides a fast and easy way to send Sage Accpac ERP forms to Payroll, Accounts Receivable, Accounts Payable and Purchase Orders via email or fax. Ask us today about eTransmit! SPN Inc. proudly serves clients across Canada including Barrie, North Bay, Collingwood, Huntsville, Orillia, Gravenhurst and Muskoka. Call us today at (705) 792-1706 or by email at info@spninc.org to find out how SPN can help you find and implement the solutions that fit you! The Solution Provider Network Inc.